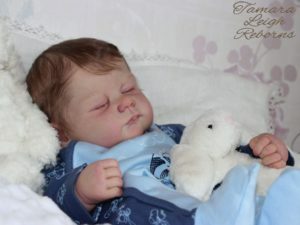 This Realborn® 7 Month June Awake reborn doll kit has been eagerly awaited. 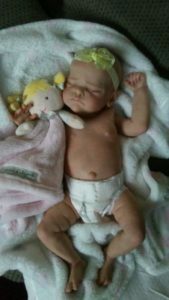 This kit when completed makes a 25 inch reborn doll. 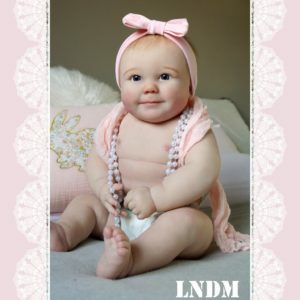 Real baby June is the daughter of Ann, event coordinator for the ROSE International Doll Expo. June has been captured again at the adorable age of 7 Months old! 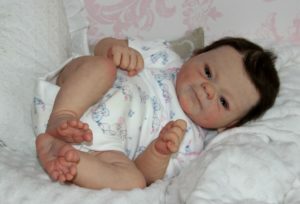 A Realborn® is a replica of a real baby. This kit has full arms and legs and comes unpainted and ready to reborn. 7 Month June is about 25 inches long when completed, with a head circumference of approximately 18″ inches. June will fit our chubby Realborn® belly, which is sold separately. You can also purchase a belly/back torso designed to fit her. Note: Our US body #8828 is our preferred body for 7 Month June when using her front belly plate. The price for this kit will be $79.95. 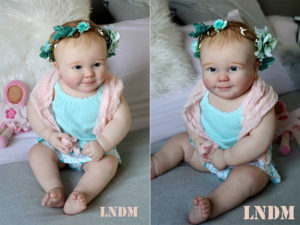 As June is an awake baby, you will require a set of 24mm eyes.